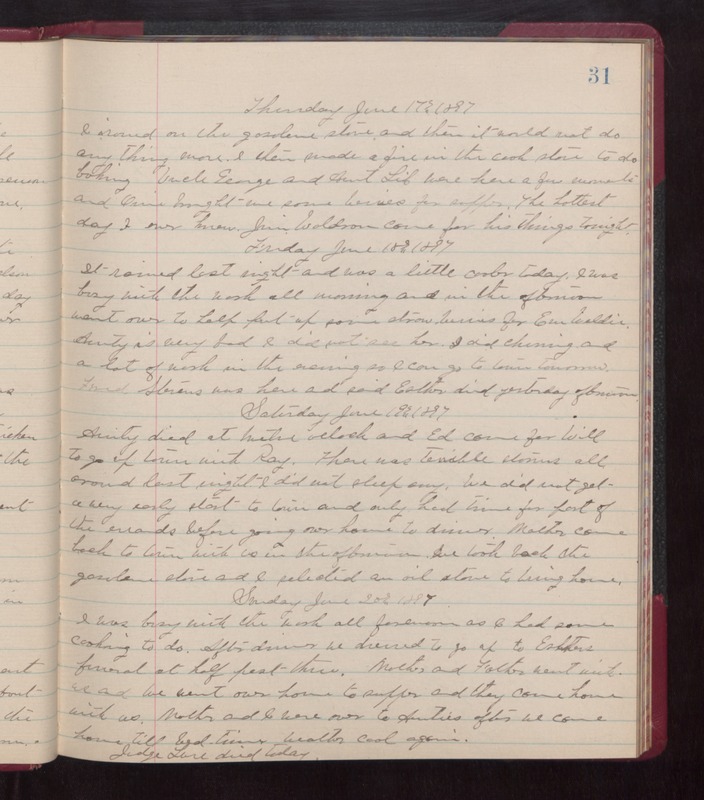 Thursday June 17th 1897 I ironed on the gasolene stove and then it would not do anything more. I then made a fire in the cook stove to do baking. Uncle George and Aut Lib were here for a few moments and Orrie brought me some berries for supper. The hottest day I ever knew. Jim Woldson came for his things tonight. Friday June 18th 1897 It rained last night and was a little cooler today. I was busy with the work all morning and in the afternoon went over to help put up some strawberries for Em Weldie. Aunty is very bad. I did not see her. I did churning and a lot of work in the evening so I can go to town tomorrow. Fred Stevens was here and said Esther died yesterday afternoon. Saturday June 19th 1897 Aunty died at twelve oclock and Ed came for Will to go up town with Ray. There was terrible storms all around last night. I did not sleep any. We did not get a very early start to town and only had time for part of the errands before going over home to dinner. Mother came back to town with us in the afternoon. We took back the gasolene stove and I selected an oil stove to bring home. Sunday June 20th 1897 I was busy with the work all forenoon as I had some cooking to do. After dinner we dressed to go up to Esther's funeral at half past three. Mother and Father went with us and we went over home to supper and they came home with us. Mother and I were over to Aunties after we came home till bed-time. weather cool again. Judge Lure died today.